The Term “Personal Space” Was Injected Into The English Language By? If you’ve ever used the term “personal space” to describe the space around your body, you can thank Edward T. Hall, an American cultural anthropologist, for popularizing the phrase as a succinct way to describe the bubble around your body that you consider yours. Hall was a pioneer in the field of proxemics—the study of the human use of space and the effect that population density has on human behavior, communication, and social interaction—and he laid the foundation for how we analyze and discuss the space around us in both academic and commercial contexts. Interpersonal distances, by Hall’s measure, could be broken up into four categories: intimate space, personal space, social space, and public space. The size of each of these spaces is a function of your culture, but in America, the intimate distance is typically 6-18 inches (15-46 centimeters) around your body, the personal distance is 1.5-4 feet (46-122 centimeters), the social distance is 4-12 feet (1.2-3.7 meters), and the public distance is 12-25 feet (3.7-7.6 meters) or more. The distance within the personal space is the area that we psychologically consider ours and equates, roughly speaking, to the circle created by our outstretched arms. Most Americans, for example, prefer not to have someone they don’t know inside that space outside of extenuating circumstances like squeezing onto a very packed subway car. 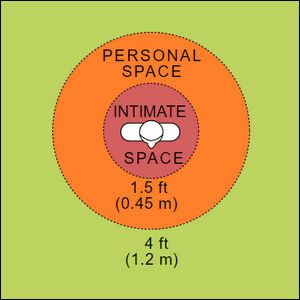 While the concept of these different spaces exists in other cultures, there is a significant variation around the world and many American travelers (coming from a culture with large personal and social spaces) are uncomfortable when coming into contact with cultures that have different ideas about the size of these zones. While most Americans would prefer to converse with a person they had just met at a distance of 4 feet or so, in areas of Europe and South America, conversation distances are typically closer than that (which would lead an American visitor to have a sense that the people addressing them were, perhaps, a bit too intimately close). Image courtesy of WebHamster/Wikimedia Commons.